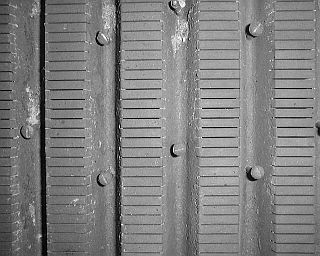 Seen in this close-up photograph are the slots and valleys of burner grate. Underneath the grate the vaporized kerosene fuel is mixed with air. The air-fuel mixture is drawn up through the slots in the grate where the combustion process occurs on the top side of the grate. The Cruban (and all Stanley burners for which the Cruban was an after-market replacement) operate under the same principals as the Bunsen Burner and are very similar to the construction of a gas barbeque or kitchen stove. The burner grate is of cast iron as are the rest of the burner castings. The top of the burner grate is flat and thin slots are milled into the grate so that they penetrate the thickness of the grate but only in the flat areas of the grate. In the valleys between the columns of grate slots is placed insulation. The screws serve to hold the insulation in place. The purpose of the insulation is to limit the exposure of the grate to the heat of the fire above the grate. This insures that the grate casting does not become hot enough to ignite the air-fuel mixture below the grate. Restoration of the burner involved glass-beading all burner casting surfaces. The slots were then cleaned out of carbon and other matter with a thin saw blade. There were two small cracks in two of the insulation valleys of the grate which were repaired with high-temperature ceramic adhesive. The couple of screwed that had broken off were drilled out and replaced.